Are we witnessing climate change? 2015 started with the earliest bud break in our history! We saw very hot (42 °C +) summer days (record high June temperatures) which lead to one of the earliest harvests on record: August 18th! After the initial scare of forest fires and the small chance of smoke taint passed, harvest took place under ideal conditions. The fruit was homogeneously ripe with little to no need for sorting. 2015 Ava is open knit and one of the most readily enjoyable vintages of Ava upon release. Viognier and Roussanne have seamlessly married together on the nose and palate while the yellow orchard fruit and weight of Marsanne is most noticeable on the finish. 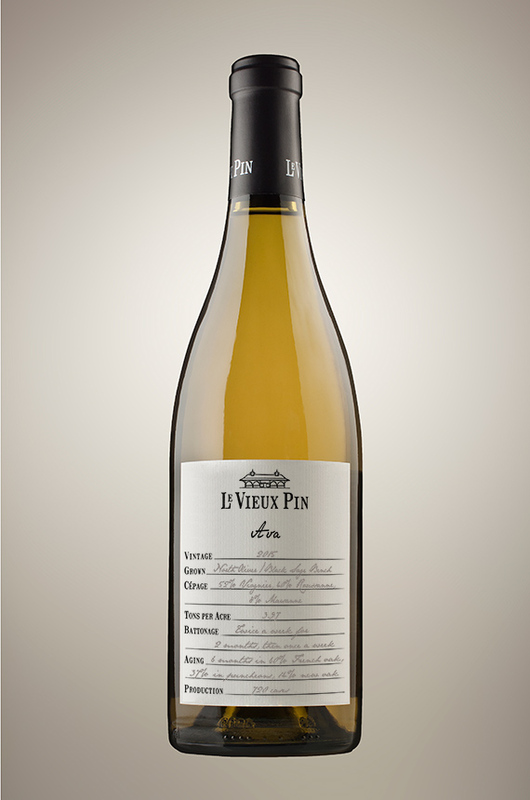 White peaches and apricots mingle with white flowers, green tea, and crisp crab apple notes greet you on the nose. The modest amount of new oak is well integrated and barely shows itself more than a thin frame around a beautiful painting. There are slight notes of acacia honey drizzled on a brioche bun that are already present and going to develop further with bottle age. Also anticipate beautiful toasted cereal notes to come forward about half a dozen years post vintage. Heritage roasted chicken with traditional stuffing or game bird with tropical fruit accents. Glacio Fluvial Fan; Gravel and sand at Crowley Vineyard, mostly Sand and Clay and rare pockets of Gravel in Le Grand Pin Block. The warmth of 2015 was not easy on this blend of viognier, marsanne and roussanne but the winemaking adjustment was made and so the approach simplifies things a bit, which is nice. Viognier without too much weight or alcohol, good floral support from roussanne and a spot or two of benevolent encouraging marsanne. The airy aromatic freshness of an early morning spring glade glides with lemon drop into honeyed lemon flavour. Could put away a glass of this when days are cold and when days are hot. Drink 2016-2019.